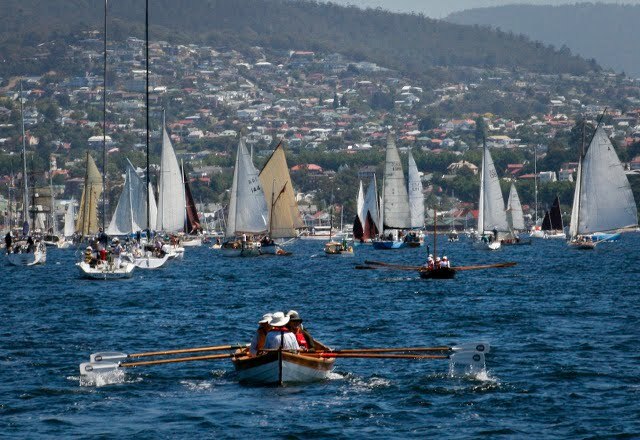 There is nothing quite like the Parade of Sail as the wooden boat fleet sails in together. And we were all there! Even raiders who'd been in hospital were back for the beautiful mayhem on the river. After leaving Howden and rowing or sailing some distance, the smaller boats were then towed so that everyone was at the John Garrow Light by 12.30. There was even time to go ashore in Sandy Bay for coffee on the beach. Eventually all were safely rafted up in Waterman's Dock and in berths in ConDock or King's Pier. At three we headed to the Hope and Anchor for a farewell party. A huge thank you to Ros Barnett, for yet again organising the Tawe Nunnugah. This amazing event would not happen without her thousands of hours of work so that others can have fun. Have a wonderful WBF ! The second last day was sunny!!! Amazing change in the temperature too and winter clothes put away. After breaking camp at Quarantine Bay we had a long leisurely sail, tacking out of Barnes Bay with all ships carrying full sail. Even Rhonda H was there looking great. The plan was to take a lunch break on the beach at Dennes Point and many of the front runners did this. Some went swimming and to the cafe for coffee and (more)? lunch. The tail enders headed straight to North West Bay and our camp at Ian and Cathy's peninsula. After having been becalmed briefly in mid channel, when the sea breeze arrived some very fast sailing was done! Another wonderful day on the Tawe Nunnugah! Boat Festival - here we come! 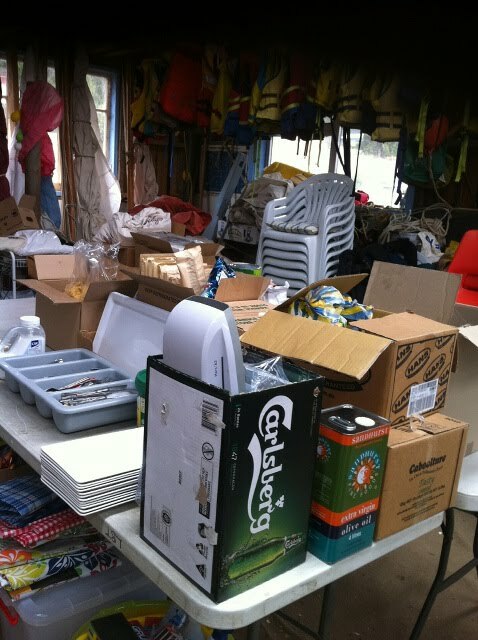 Mid afternoon and the party is settled in to camp in Quarantine Bay in Barnes Bay. The wind is till blowing 20 knots, though it was a bit less as we sailed or rowed the11 nautical miles to our second last camp. There were only a few minor spills and swims and fairly cold people by the end The larger yachts have taken shelter on the opposite side or in the Duck Pond. The fleet looked spectacular coming the channel with many boats quite close together and accompanied by Yukon and Boxer. The Boxer boys and Riversong and Jenny (the Brissy boys), have failed to join us yet as they took a short detour to Kettering. Wonder why! Still hoping for some summer before the raid is over. Another successful day on the water for the fairly short trip from Alonnah to a new campsite on private property at Simpson's Point. Again the weather was pleasant in the morning as we ran north but became windier till it was blowing about 20 knots as we rounded the corner into Simpson's Bay. As small groups explored the property and climbed the hill for the VIEWs, we saw 'Yukon' sailing in to join us. Several new boats and crews have joined us today and others who left due to weather or were held up temporarily, have rejoined. A new partial crew arrived from Brisbane to replace four 'Boxer' crew members who are heading home. Again it looks like rain but we are bravely wishing it away. And to top off the beauty of this place the 'Lady Nelson" has just sailed into the bay!!!! After a great night at the Far South Camp at Dover, (with more great food thanks to new cook Daniel) the fleet left early on a beautiful summer-like morning. It was so amazing to see the sun again! As this was not going to last, there had to be a quick get-away since the next front was due at noon. 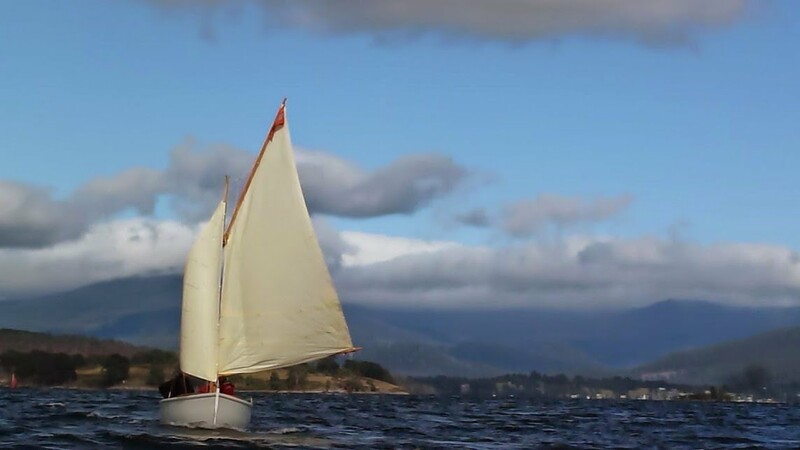 The sail across to Bruny was great – perfect sailing weather – until the front arrived on cue. The last few kms were a little bumpy but nothing compared to the seas we had to contend with coming from Recherche. The rowers, found it a little messy approaching Satellite Island but all got in safely and were treated to the sight of Boxer bearing down on us under her huge sails though she only had a fraction of her sails up. 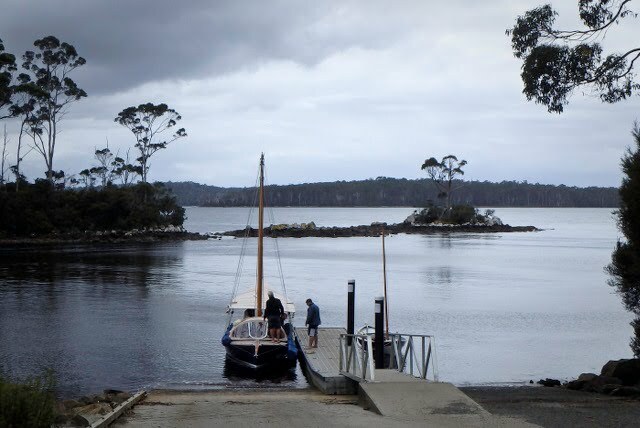 Some yachts chose the stay off Satellite Is and won’t be coming ashore and a bus load of folk went off the visit the Bligh Museum at Adventure Bay. Camping near the pub should make for a happy evening and set us up for another early start to Simpson’s Bay tomorrow. 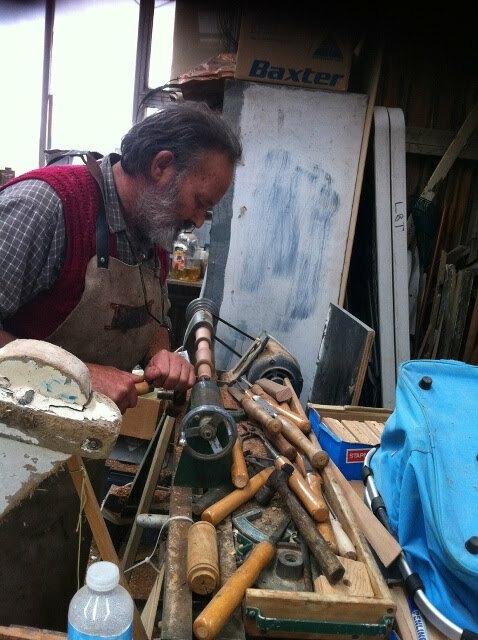 See the gallery for more pics. Nell Tyson tells us that it was still lumpy. 'Finally the weather has eased a bit and the larger open boats and the yachts are on their way. The plans have changed to accommodate the delay and everyone is headed for the Far South camp at Dover. All 15 boats headed for the Pigsties in the far northern corner of Recherché. 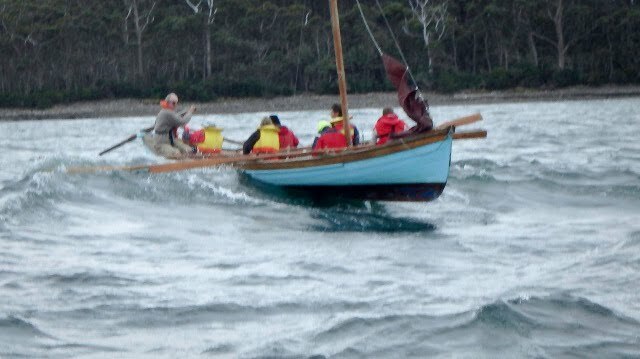 Once out of the shelter of Cockle Crk, there was a good swell that had the small boats working quite hard and the yachts wallowing nicely. Lunchboxes came out on the sandstone shore and the 'foreigners' (mainlanders) -went wild collecting mussels and oysters - not really believing the abundance of wild seafood just there for the picking. Everybody walked to the French Garden and spent a few contemplative historical moments imagining d'Entrecasteaux's party and their hopeful gardening attempts. The sail back was a beat back into the south easterly and was an 'interesting' ride. (Note Swiftsure partially airborne or 'underwater'). Kevin - skippering her, was peeved that I didn't manage to get a shot of him airborne on the helm!!! Everyone did get back safely but all agreed that if it wasn't considerably quieter tomorrow they wouldn't be leaving the bay. Dinners have been great, singing and ukelele lessons hooting along, drinking is in 'sensible amounts' and we are all having a ball!